into the world of color, but I still don't think I can pair two crazy colors together just yet. cute at the same time. Will definitely be stomping around the city in these more. Well I am off to work this morning... Hope you all are having a wonderful day! the third pic is my favourite! Oh! I want that weather in my country! You look graet! Love your weather , I want this weather ! love the colours and that jumper is gorgeous! new post on my blog! I'm waiting for u!! I love the red pants. Great summer outfit! I love the pattern on that sheer sweater. I wish I could knit/sow and make my own sweaters. I'd have a bazillion :P You look super cute as always! I love your top and the pop of color in your pants! LOVe this look and LOVe that top!! Those shoes are AMAZING! And I love your top and jeans! I've been dying for red jeans but I don't know if I could even pull it off! You look amazing in the outfit! your shoes are so amazing, and your hat also. you're always so stylish.. Such a lovely summer look! 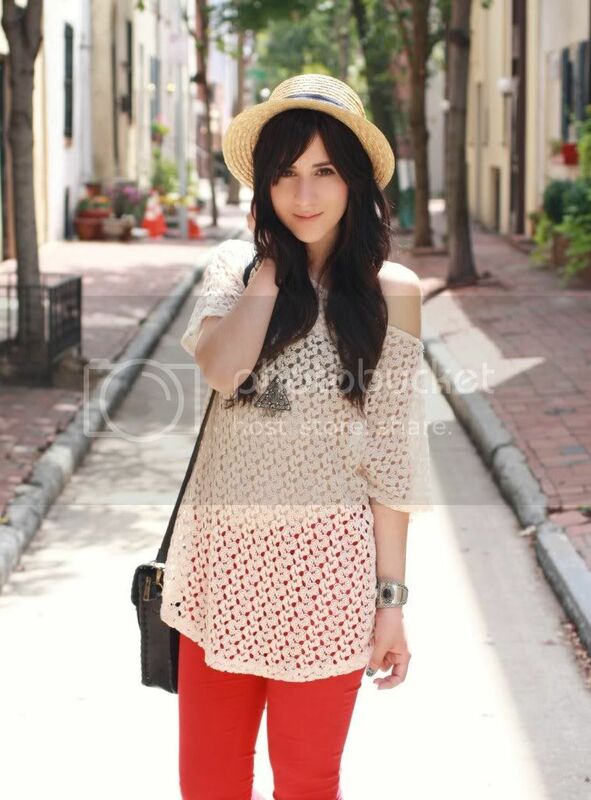 The dainty crochet is so darling paired with those hot trousers! I love this look so much! 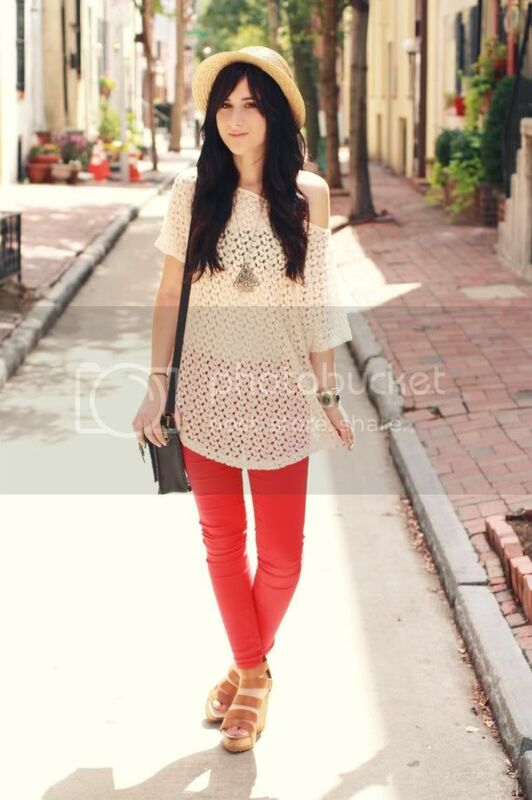 Like the combo of the lace top and red pants! You look so lovely! 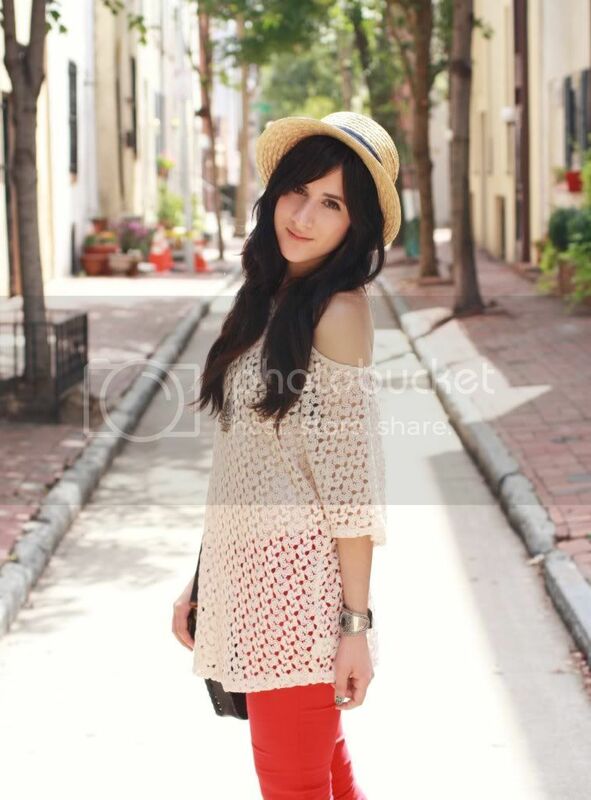 Love your crochet top and shoes !! cream+red is my best mix of colors! !you are so fantastic!!! You always have the best backgrounds for your photos. Where were these taken? That street you shoot from is so so beautiful! Love to see you in red bright pants, top is gorge. SO cute! Love that top on you. love the red skinnies - I just got a pair myself & can't get enough of them!! You look great on these photos!! I love your red pants! Oh, I just love that top I've been lusting over it in mustard! So, sooooo cute! We love it! I really like how your jeans pop up as a red sign in all those neutral tones. Good for a sunny weather. Omg I kinda can't even believe you can wear skinny pants in this heat!! Super cute outfit though, love the top. The top looks great with the pop of red! I adore your cuff. When you work up the courage you'll look amazing all colorful! But I do love that top against that fabulous red! I love those red pants! I've been on the hunt for a pair, and those are perfect!! your outfit is perfect! i love the detailing of the crochet knit. Really cool red jeans! I just got a pair so this is great inspiration! lovely outfit under the sun! you're purdy. and i like them shoes!! I love love love your jewellery and hair. Gorgeous look. Really cute shirt and hat!! Love this top! So perfect with those red jeans! That knit top is AMAZING, Bonnie! this is fantastic! the texture and open weave of your top is just lovely. i also love that you paired it with such bright pants. darling! 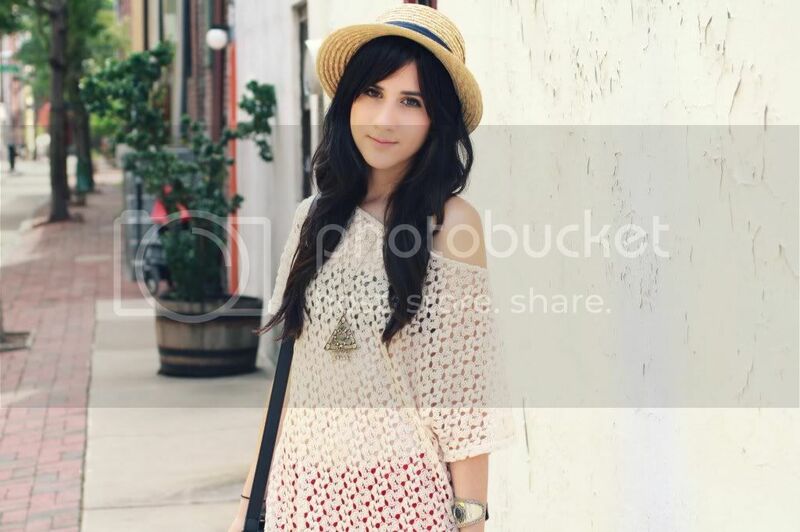 i especially love that open weave top, i just wore something similar in my most recent post. That top is absolutely beautiful! You look stunning as usual, Bonnie! I love the color on the pants! so fresh!!! Click here to check out my summer giveaway, I know you will love it!